Everyone knows that it’s possible to download Windows 10 ISO from Microsoft using the official Media Creation Tool. There are some other tools also available to download Windows 10 ISO, but the Media Creation Tool is better than third-party tools for obvious reasons. While downloading Windows 10 ISO using Media Creation Tool is easy, the method is tedious as you need to make about a dozen clicks to download the ISO image. 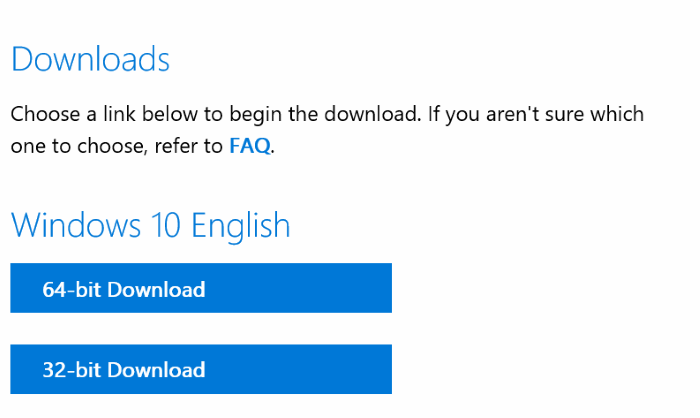 Microsoft has designed the official Windows 10 ISO download page URL such that the page shows different content depending on from what device you are accessing the download page. A small section of PC users download Windows 10 ISO whenever a new version of Windows 10 ISO is available so that they can perform a clean install of Windows 10. For users who often download Windows 10 ISO, downloading the Media Creation Tool and running it on the PC is a time-consuming job. Because of this, many PC users want to know if Windows PC users can download Windows 10 ISO without the Media Creation Tool. 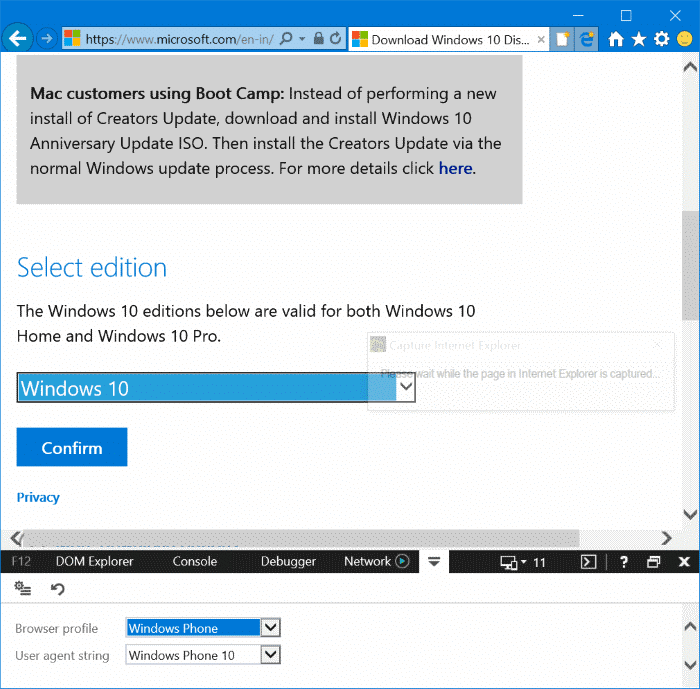 Yes, you can download Windows 10 ISO from Microsoft without the Media Creation Tool. To do so, all you need to do is disguise your PC as a Windows Phone or Mac machine. Wait, you don’t need to install any software to disguise your Windows 10 PC as a mobile device. You just need to change the default user agent in your web browser. Here is how to do just that. Complete the given below directions to download Windows 10 ISO image files from Microsoft without using the Media Creation Tool. Step 1: On your Windows 10/8/7 PC, launch Internet Explorer browser. Head over to Windows 10 ISO download page to see the following page. Step 2: When you are at the download page, press F12 key to open Developer tools. Don’t worry. It’s easy. Step 3: Now, in the Developer Tools, switch to the Emulation tab. In the Browse profile, select Windows Phone from the drop-down dialog, and then select Windows Phone 10 from the User agent string drop-down dialog. You are almost done! Step 4: Internet Explorer will automatically reload the page. 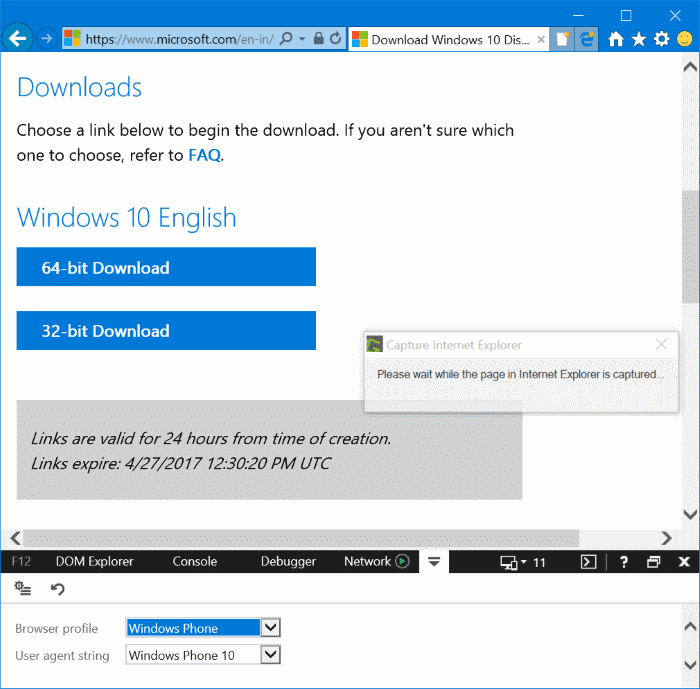 If not, refresh the page (URL) now to see Download Windows 10 Disc Image page. Choose your edition of Windows 10 (Creators Update is the latest one) and then click Confirm button. 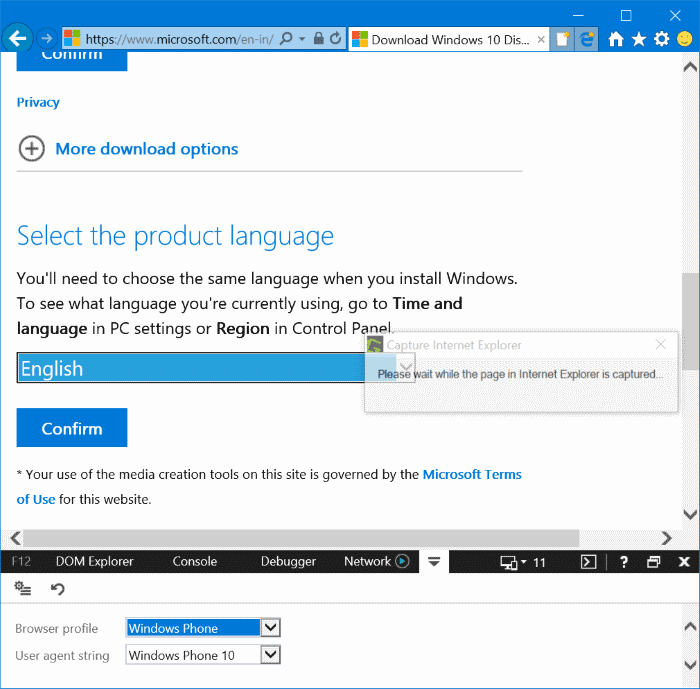 Step 5: Next, you will see Select the product language page. Choose your language and then Confirm button. Step 6: Finally, click either 32-bit Download or 64-bit Download (depending on what type of Windows 10 you want to install and run on your PC) to begin downloading your Windows 10 ISO image file. Once the download is complete, you may close the tab or browser. You can also download this via your android phone, then copy this to your machine and burn the iso. Awesome, thank you for this assistance! Worked like a charm! I have a valid code but didn’t want to do the media creator. PS, I used ‘Custom’ for the Agent, and then made the Orientation ‘Landscape’ to be able to see what I was doing. Thank you so, so, so much! I tried using the MediaCreationTool1803.exe and it would not work. This has made my task so much quicker! Thanks again! Thank you! I was lost without this article! as you know that after leaving windows 10 installed for more then thirty days it erased the old operating system from the recovery partition.. I would like to reformate the drive and install the ios in the recovery partition. is this possible and is it complicated??? You can also use User Agent Switcher for Chrome and select Windows Phone and the page will reload and give you the same options described in this article.